About me. I was born December 20, 1954, basically into the arts, picking up my first instrument, the accordion, at age five, and then moving on to the coronet and trombone. At age twelve, I began my relationship with the guitar and have pursued all aspects and styles of both performance and instruction from then until now, and, as far as I can see it, on into the future. Although I have studied privately with numerous teachers, my formal musical education was at Berklee College of Music, Boston, MA. During that time, I was fortunate enough to have studied with legendary musician and educator William G. Leavitt. For a time, I worked as an Alumni Representative for Berklee attending music educator conferences, college/career fairs, and various festivals and trade shows throughout the country. As if that weren't enough, I somehow found time to add piano to my list of instruments, studying for an unfortunately brief time with pianist and twentieth-century composer John Scully. In order to honor my teachers by attempting to pass on at least a fraction of all I have been given, in 1989 I opened the Reinhart Studio, offering private instruction in all facets of guitar, piano, and music theory. Now, lest you think I am all classroom and little real-world, let me assure you that I am, and always have been, an active performer of music as well as being a teacher. At age fourteen I made my debut as a classical guitar soloist, and throughout the years have played in various bands, covering a wide array of musical styles, including classical, jazz, rock 'n' roll, ethnic, country, dance, and big band. Also, for over twenty-six years I was the guitarist and keyboardist with 'Jay Black and the Americans' ('This Magic Moment,' 'Come a Little Bit Closer,' 'Cara Mia,' etc.). Currently, I am based in Northeastern PA working as a freelance performer, playing with numerous local bands and as a solo artist on both guitar and piano. But wait, there's more. When it comes to the arts, I have never limited myself to a single discipline. 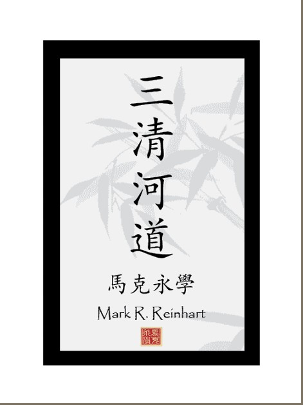 Since the 1960's, I have had a deep interest in, and affinity for Eastern Philosophy, and in the early '70's, I began studying Korean and Japanese external styles of martial arts. A physical problem led me to Taijiquan as a form of movement therapy and for the past twenty-plus years I have been a student/practitioner of the Chinese Internal Arts (Taijiquan, Baguaquan, Xingyiquan). Currently, I am a Fifth Generation student/practitioner/teacher of the Yang, Jian-Hou Medium Frame style of Yang Family Taijiquan, studying under Fourth generation Lineage holder Larry C. Eshelman. Fascinated by the healing powers of these arts, I began to study Medical Qigong and received my Medical Qigong Therapist certification in May 2005, and my Master of Medical Qigong degree in April 2007, under Dr. Ted Cibik N.D., D.M.Q. (China) at Inner Strength Inc., Leechburg, PA, in conjunction with The International Institute of Medical Qigong, founded by Professor Jerry Alan Johnson PhD.D., D.T.C.M., D.M.Q. (China). In addition, I have been certified in Neuromuscular Therapy (The St. John Method), and am currently completing the final requirements for full certification in Chinese Herbal Medicine through through The Institute of Chinese Herbology. My studies continue in Chinese Herbal/Dietary therapies, Essential Oils as well as all other aspects of Classical and Traditional Chine Medicine through my ongoing studies with Jeffrey C. Yuen at the Chinatown Wellness Center. Believing that Qigong and Taijiquan can provide much needed benefit in today's society, I am an active participant in Francesco Garripoli's Qigongtracker.com. I speak frequently at many various support groups spanning a wide range of health issues, and am a certified instructor for several Tai Chi For Health Programs developed by Dr. Paul Lam. I was fortunate enough to learn these programs directly from Dr. Lam thanks to a scholarship through the Tai Chi for Health Community of which I am a member. Also, I am a Professional Member of the National Qigong Association have served on the Board of Directors for seven years and was President for four years. Last, but not least, I am the founder and creator of San Qing He Dao, The Path of Three Pure Rivers a system dedicated to the re-balancing of the person through purification to the three rivers, which constitute the totality by which we flow through existence. From my tradition has evolved Three Rivers/12 Steps: Qigong For Recovery an integrative approach to addictive disorders merging the 12 Step program with the elegance of the Chinese medical and spiritual traditions. Eclectic as my various endeavors may seem, they are held together by "the silk thread called art". Practicing, studying, learning, performing - what good is the accumulation of all this knowledge and experience unless I am able to share it with others? To that end, I continue to be available to anyone seeking what I have to offer at the Reinhart Studio, 308 W. 36th Street, Suite 100 in Hazleton, PA. In addition to private music instruction, classes in Chinese Internal Martial/Healing Arts are available, as is private Medical Qigong Therapy and Chinese Herbal & Dietary counseling. "The uniqueness of any single life is the commonality we all share."